Engineered hardwood flooring is a product made up of a core of hardwood, plywood or HDF and a top layer of hardwood veneer that is glued on the top surface of the core and is available in almost any hardwood species. The product thus has the natural characteristics of the selected wood species as opposed to a photographic layer. The "engineered" product has been designed to provide greater stability, particularly where moisture or heat pose problems for solid hardwood floors. The instability of solid hardwood is usually moisture or heat related. 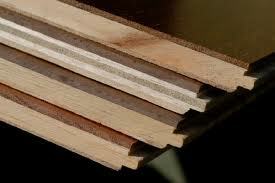 Under adverse conditions, solid hardwood floors can warp, cup, swell or split apart. Engineered hardwood flooring overcomes these problems by constructing a multiple-ply plank which counteracts twisting and remains flat and intact. This makes engineered hardwood flooring a better choice for installation over radiant heat sources, over concrete whether it's below grade or above, and in rainy climates. There are many layers associated with an Engineered Floor; In addition to the top hardwood veneer, engineered wood flooring typically has three or more core layers. Of course, there is greater stability with more layers. The core layers may be plywood, high density fiberboard, or hardwood. 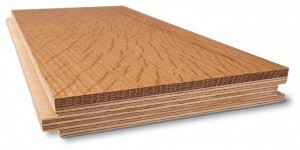 For example, Vanier engineered flooring has five to seven hardwood core layers. The hardwood veneer, or top layer of hardwood (which can be chosen to be any species of wood desired), can typically be 0.6mm to 4.5mm or more in thickness. A quality hardwood veneer will provide many years of wear. For example, Vanier engineered hardwood flooring has a Select and Better 2mm hardwood veneer and comes with a 25-year finish warranty. The most common question asked about Engineered Floors is "How many times can I refinish the floor? " The answer is: It depends upon the thickness of your hardwood layer but the fact is that 95% of hardwood surfaces are never refinished. With the high quality finishes that are offered and the extensive process that refinishing a floor entails, damaged areas are often removed professionally. 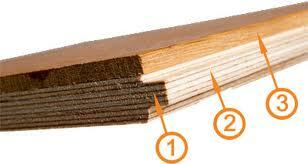 If sanding is desired, typically, the professional sanding procedure removes 1/32 of an inch. Thus if your floor has a 2mm layer you can sand the floor 1-2 times.